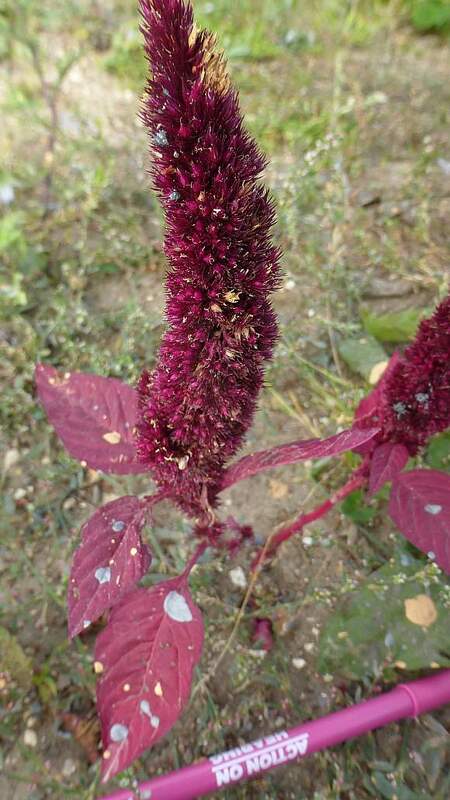 Very similar to Purple Amaranth (Amaranthus cruentus) which also has flowers which are either red, or green, or yellow. 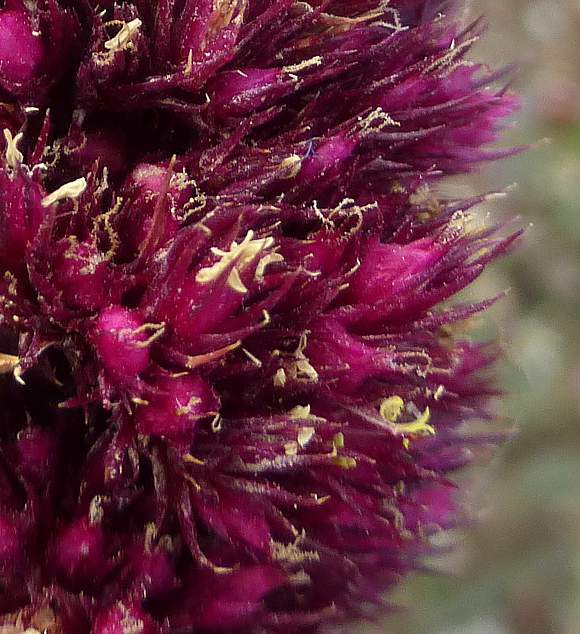 But Purple Amaranth has a floppy inflorescence (stiff on Prince's-feather), plus bracts which have a stout midrib (thin on Prince's-feather) and styles which are thicker at their base (not thickened at base on Prince's-feather). However, the also similar Love-lies-bleeding (Amaranthus caudatus) has a much floppier inflorescence which are pendant and usually comes in deep-red but can be either green or yellow or white. The terminal inflorescence is often longer than 30cm and heavy. The leaves are here broad-lanceolate with smudges of the prevailing colour of the inflorescence, modulated by the greenness of chlorophyll. The leaves join the main stem by a long leaf-stalk which continues conjoined down the stem for quite a distance before merging fully. A striking colour duo resemblance between speckled leaves and walking pole: 'In the Land of Grey and Pink' - Caravan. The longest bracteoles of the female flowers are equal to or up to 1.5 times longer than the perianth (= calyx + corolla length). Also, the tepals all taper to an acute-angled apex and there are 3-5 [not 2-(3)] tepals which are just shorter than to longer than the fruit. The fruit is irregularly dehiscent. There are some fruits in the photo, they are concolorous with every other detail apart from the styles which are fawn-coloured. The bracts are shorter than (or equalling) the extent of the styles. Almost all Amaranths (usually including this one) are monoecious, with separate male and female flowers which are all on the same plant. Your Author surmises that the male flowers are those with much wider fawn bits (the anthers? - but it is hard to be sure). Not to be semantically confused with : Parrot's Feather (Myriophyllum aquaticum), Feathery Rhodes-grass (Chloris virgat), [plants with similar names belonging to differing families]. It is a rather rare casual plant (but because it is not native, does not get any [R] rating). 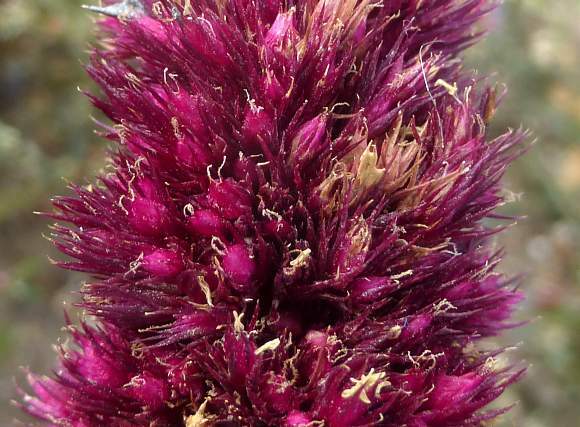 It is probably derived from Powell's Amaranth whilst in North America. It is now found in SW England and South Wales.